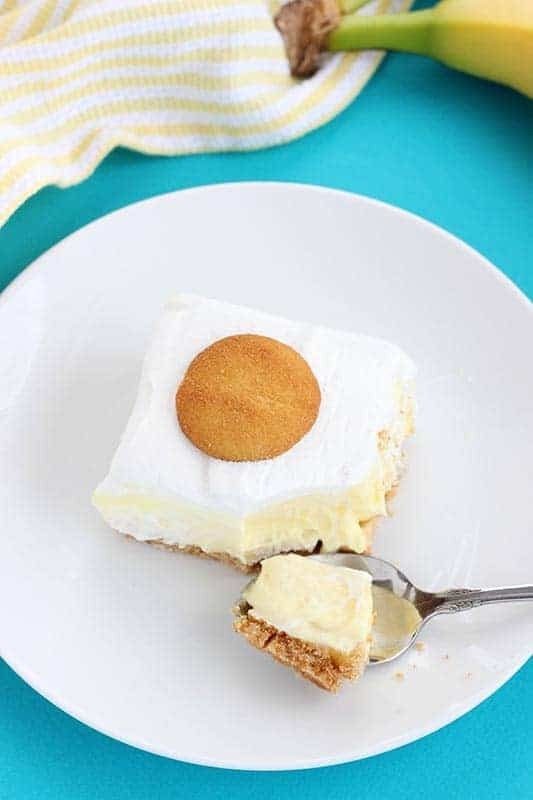 Banana Cream Pie Bars. 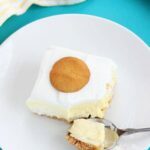 Fresh sliced bananas are placed on a vanilla wafer cookie crust and topped with vanilla pudding for a super simple and delicious dessert recipe. 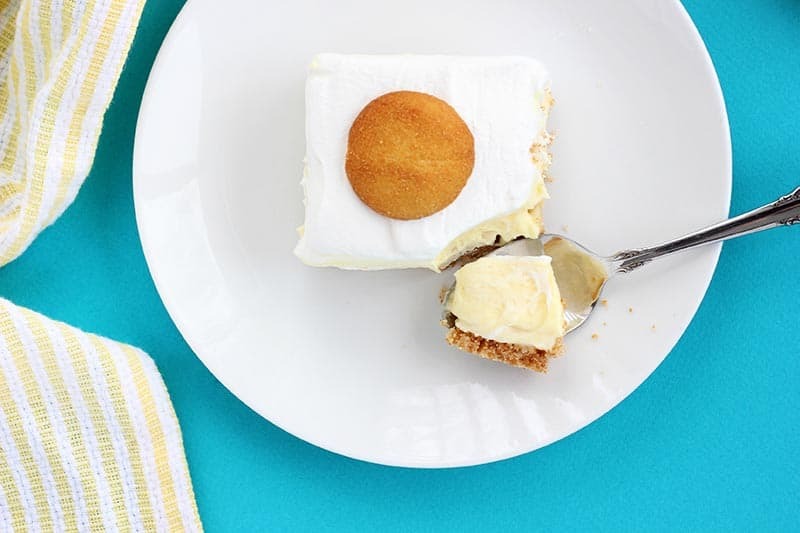 Is there anything better than a good old fashioned banana cream pie? I have had a major craving lately and knew I needed whip up the sweet dessert. I had a box of mini vanilla wafers, a favorite go-to snack, on hand and a couple of super overripe bananas ready to be used. If that is not a sign, I really don’t know what it. To make things easy for giving I turned this fun dessert into a bar. Slice them into easy squares and serve with a vanilla cookie on top! This dessert recipe is fantastic in so many ways. Creamy pudding and fresh cut bananas always make for a winning combination. I smashed a hefty amount of vanilla wafer cookies into crumbs, stirred with a little melted butter and pressed firmly into a 9×13 pan. Top with sliced bananas, pudding, and cool whip and you’re basically ready to devour this dessert! Like this recipe? You should try my Banana French Toast, Banana Cream Pie, and Banana Cream Cheesecake. Combine your cookie crumbs with the melted butter. Press firmly into a 9x13 pan. Bake 10 minutes. Allow to cool completely. Place your banana slices on top of the baked crust. Whisk together the vanilla pudding and milk. Spread over the sliced bananas. Top with cool whip and chill 4 hours.